As these are known for, they’re pretty dry and crumbly. Despite that, they have a pleasant crunch and actually taste like a chocolate chip cookie. 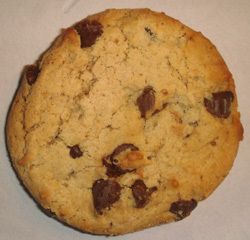 I think the best part of the cookie is the chocolate chips, they had a nice chocolate flavor and there was plenty of them throughout the cookie. These are just as dry and crumbly but with much less flavor. I was so confused, these weren’t Rippin’ Good at all! The dough had a pasty, chemical taste and the chocolate chips were like bland tasteless, waxy pellets. All these were A-Plenty of was blah. Ahoy! 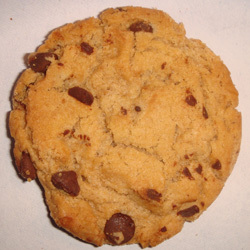 We have to say that the crew at Nabisco makes a better, dry crumbly cookie than the yahoos at Rippin’ Good. 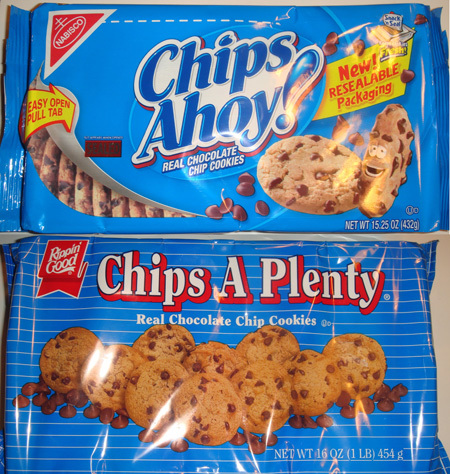 Even though they pretty much had the same texture the flavor of Chips Ahoy made it a much better product. Chips Ahoy or Chips A Plenty? The chips ahoy in Australia have changed, I don’t like the new style, not as nice dough wise as before. They probably sell Chips A Plenty at that cheap place I used to buy groceries at when I was young and broke – the same place that sold me a can of green beans that had a dead roach inside. Thanks for the memories, Chips A Plenty. I love Chips Ahoy, but I love it even more now that they have that resealable packaging. I hated those bending tabs with the old package. Rippin’ Good cookies are actually made in Ripon, Wisconsin. There is (not sure if it’s still there) a cookie factory outlet store there where you could sample all the different cookie flavors. I loved that place. Rippin’ Good doesn’t really conform to the “Second Rate” label. They are really more fifth-rate–or worse. The Rippin’ Good ones have changed in the last few years. When they were actually made in Ripon, they were as good as the Chips Ahoy. However, a few years ago they outsourced the portion of theplant that makes that type of cookie (including oatmeal, raisin, peanut butter, etc.) and now make ’embedded’ cookies at Ripon — which is all of the chocolate coated cookies like striped dainties, mint cookies, frosted animal crackers, etc. The quality of those is still good — very good in fact when you go over to the cookie outlet store because they are at max a week old, whereas those in the store can be months old. But I would no longer buy one of the other types from them anymore because they are just nasty! Rippin Good makes pretty good tasting sugar wafers! I have yet to try their other cookies.